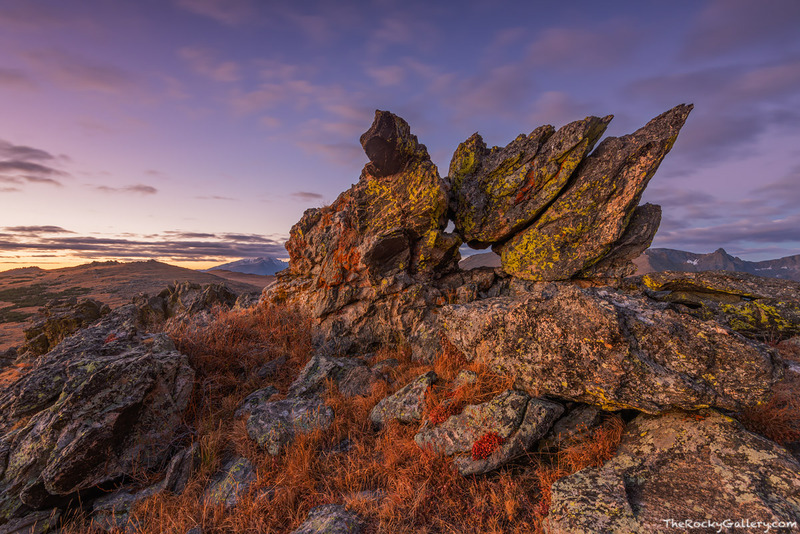 Above treeline on the barren and harsh landscape that makes up the alpine tundra of Rocky Mountain National Park, rocks and boulders are spread across the landscape. Many of these rocks and boulders are known as glacial erratics. Many of these rocks being moved and placed when ice from melting glaciers of previous ice ages deposit these rocks on the landscape. This particular piece of rock is one of my favorites in Rocky Mountain National Park. It forms a near perfect arch but also has the shape and form of a sundial. Just before sunrise on a cool October morning the predawn light illuminates the autumn color landscape. 14,259 ft Longs Peak can be seen in the distance on the left hand side of the image and the Hayden Spire on the right. Photo © copyright by Thomas Mangan.